The Civil Service Commission (CSC) will have a schedule this year to be held on March 12, 2017, and August 6, 2017! 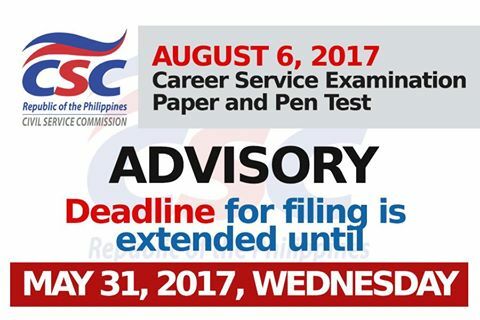 In the said announcement, Civil Service Commission (CSC) reminds that those interested examiners shall file their applications as early as possible because acceptance of the application is on a first come, first-served basis and may close any time before the deadline if the Regional/Field Offices has already reached the target number of applicants. Schedule and Deadline for filing for 2017 Civil Service Examinations for the Professional and Sub-professional level. Announcement: Deadline for filing for August 6, 2017, CSE-PPT has been moved to May 31, 2017, or earlier once the quota is reached. The CSE tests are open to Filipino citizens, regardless of educational attainment, who are at least 18 years old at the time of filing of the application and have not taken the same level of the examination within three months before the date of examination. Those who failed the October 2016 exam may take again the March 2017 exam. Have a check with this 2017 Civil service examination reviewer and tips — and it is FREE! The CSC also stressed that applicants must personally submit their applications at the CSC Regional Office (CSC RO), or at any of the CSC RO’s Field Offices, where they intend to take the examination. Examination fee for both levels of examination is Php 500. Are you a passer now? Chek this out on How to get your CSC Certificate of Eligibility! Do you have some comments? Kindly cast your ideas below.